"The school children have come back to a beautifully restored church," says Father Roman, Assumption Church pastor. "For most of the summer, the church was filled with huge scaffolding! 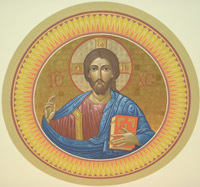 All of the artwork was painstakingly restored or re-gilded, the walls were painted, a new confessional was built, and a decorative wall treatment was done for the Stations of the Cross," he added. A film of dirt collected in the 30 years since the last major renovation; just from normal use. Restorers use a special cleaner that removes dirt but preserves the artwork. Gilding is either painted on, or done with incredibly thin sheets of real gold; so thin that light goes through it! 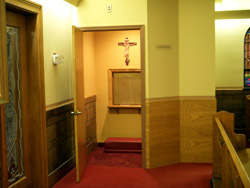 The renovations are being done in preparation for the 100 year Jubilee of the Assumption parish in 2008. 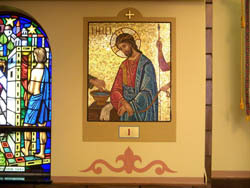 A decorative treatment was added for each Station of the Cross. Icons were cleaned and re-gilded.